Home Strollers Double Strollers NEW! Diono Traverze Twin Double Stroller – Review! There is so much anticipation for the Diono Traverze Twin that is expected to be released this year! They have taken the ever so popular single Traverze and made it twice as nice! The Traverze Twin has a lot of the same features that the single has. It weighs only 24lbs, has super comfy seats with memory foam padding, a full canopy and a deep recline for easy napping on the go! The Traverze twin still has the one-touch brake that is flip flop friendly, one hand fold and unfold and plenty of storage under both seats as well as seat back pockets on each seat! When will the product be launching? There is not a specific launch date at this time, but it will be sometime in 2019. What are the age restrictions? Birth? 3 Months? We do not have the specifics for this model yet, but will update as soon as we do! How much does the Traverze Twin weigh? We are not sure at this time! Previous articleZOE XL1 BEST v3 vs v2 SNEAK PEEK! 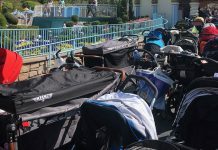 Next articleDisney Stroller Ban Policy: Which Strollers & Wagons Break the 2019 Rules!